VOA News Jul 6, 2018. 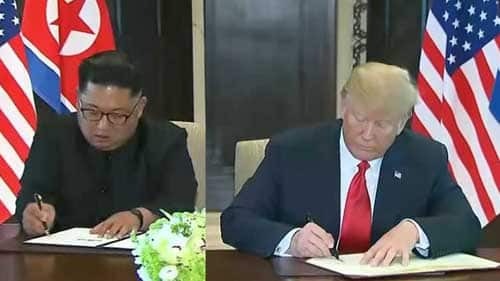 North Korean leader Kim Jong Un and President Trump signing agreement in Singapore. U.S. Secretary of State Mike Pompeo has ended the first of two days of talks Friday in North Korea about ending Pyongyang’s nuclear weapons program.The meetings come amid reports of American intelligence assessments that North Korean leader Kim Jong Un is continuing to develop the infrastructure for his nuclear program.Discussions resume Saturday. Pompeo has been charged by President Donald Trump with overseeing Kim’s promise at last month’s Singapore summit to denuclearize the Korean peninsula.The top U.S. diplomat met Friday with senior ruling party official and former intelligence chief Kim Yong Chol. It is Pompeo’s third visit this year to North Korea and the first where he will stay overnight.